4-bedroom cottage near Ditchling - Idyllic Setting Away from all Roads. Fantastic Cycle and Footpaths right from the gate. 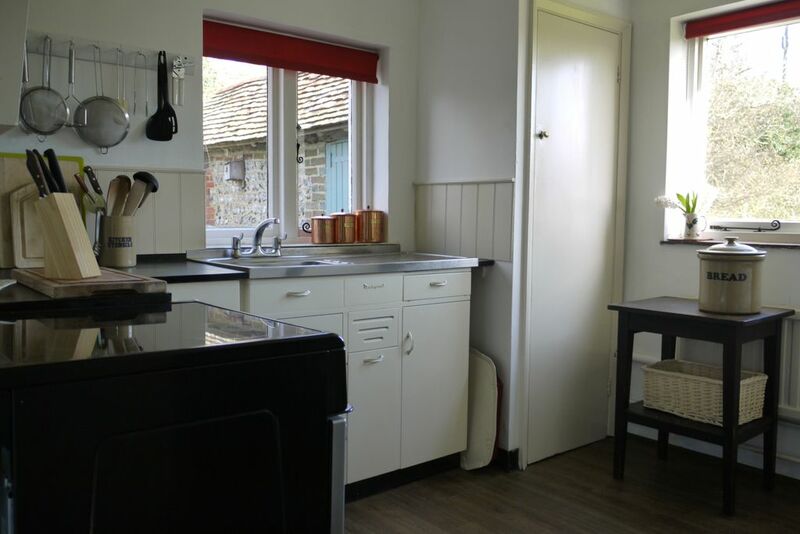 Offering privacy, tranquility, comfort and a blend old and new, this 4-bedroom, 2-bathroom (plus additional cloakroom) cottage is located in an Area of Outstanding Natural Beauty in the South Downs National Park. The cottage is maintained and equipped to a high rental-home standard, but retains a comfortable home feel. In addition to its idyllic location this property offers a range of wonderful amenities. Within a 20 minute walk along beautiful footpaths, through hidden woods and across streams you can reach the foot of the South Downs, Plumpton Racecourse, the local train station (Plumpton - just one hour to London Victoria or 50 minutes to Clapham Junction), and four highly regarded local pubs offering delicious food. A 20 minute off-road cycle will take you through lovely countryside to local shops in Plumpton and Ditchling, or the local farm shop. Within a 20 minute drive, you can reach the charming county town of Lewes, as well as the outskirts of Brighton. The coast, Glyndebourne, Sheffield Park, the Bluebell Railway, Charleston Farmhouse, Firle Place all lie within 45 minutes drive. With our two teenagers, whenever we are at Streatwick, we love walking, cycling, and riding as well as just enjoying the wonderful garden, fresh air, star-filled night skies, and tranquility of this place. For guests who are looking for an authentic private rural retreat with stunning views and lovely gardens, Streatwick is perfect. It's a great house for a family get-together or a relaxing weekend away. It's Incredibly peaceful: during the day you can watch the weather and shadows playing across the Downs, and in the evening you can see amazing star-scapes, and hear owls twit-twooing across the valley. At night you'll find comfy beds, and crisply-laundered bedlinen, and fall asleep in utter peace and quiet. Streatwick is located on a little ridge overlooking the South Downs. It is surrounded by fields and footpaths, and truly lovely countryside. The views are some of the best in the country. This is exactly where Rowland Emett built his flying car ChittyChittyBang Bang (in the older forge next door), and where Raymond Briggs envisaged his 'Snowman' flights. The cottage is secluded and utterly peaceful, yet not isolated. It is a fantastic base for exploring the South Downs, Ditchling, Lewes etc. As a recent guest wrote: " What a miracle to find such a haven of tranquility so close to Brighton and London." If you love to be able to walk (or cycle) straight from the cottage gate, in all directions, without roads and traffic, and if you love natural surroundings, then you will love staying here! toilet, combination tub/shower, This is a large family bathroom with bath and shower over. toilet, This is a downstairs cloakroom with wc and basin. toilet, shower, This is an ensuite to the smaller double bedroo. There are 2 bathrooms and one cloakroom as follows: - Family bathroom with bath, shower, washbasin, wc. -Ensuite bathroom with shower, wc and basin in the smaller double bedroom -Large downstairs cloakroom with washbasin and wc. There is central heating throughout the house, with additional electric radiators in each room. Good wifi throughout the house. Sitting room/dining room with TV, DVD player, CD player, games, dining table, doors to sun terrace. The kitchen is really well-equipped with all the utensils and crockery you will need for family cooking. Kitchen with larder, fridge, freezer, cooker and hob, microwave, dishwasher. The cottage is surrounded by its own gardens, with shady trees, and lawns for playing, eating or sunbathing. Local golf course - half a mile. Shampoo/conditioner, and soaps provided. Cleaning / Towels / Linen / Towels and linen included. Firewood and kindling provided October to March. Splendid week at Streatwick. Very homely and comfortable and well equipped with a great selection of games and books too! Peaceful, relaxing and very good and thoughtful host. Nice country walks and local pubs and brilliantly located for the railway links and airport. Charming cottage in a peaceful location, lovely views, great walks, good pubs nearby and lots to explore. Helpful owner and would rent again. Very homely, welcoming cottage with everything needed to settle in quickly. A very characterful cottage with wonderful views and in a quiet location. We visited for a 3 autumn night stay and were warm and cosy and appreciated all the basic supplies i.e. Fire wood, kindling, tea, coffee, milk etc. Large garden and great outside seating. Home from home. Would recommend Half Moon pub/restaurant nearby. Perfectly peaceful place to stay, not too 'fru-fru' so ideal for dog owners with a very nice enclosed garden. Walks on the door step plus walk to the local pub! we stayed a week with our dog and everything was perfect! Working and living in London can be stressful and sometimes I long for a bit of peace and quiet in the country with a chance to curl up in front of the fire, go for long walks, have time to read and think. Streatwick ticks all the boxes. A lovely house, tastefully decorated and spotlessly clean. A particularly well stocked kitchen for those who like to cook and crisp white bedlinen and very comfy beds for a long night's sleep. The owner, Eve, couldn't have been more welcoming. We didn't meet in person but all my questions were answered promptly and warmly, making me feel as if I was in safe and caring hands. We've already booked our next visit. Even if the weather isn't as hot and sunny as last weekend, it won't matter. The views will be just as wonderful and the fire just as inviting. Streatwick is an extremely well laid-out, thoughtfully furnished and practically resourced cottage. Everything is there, and placed where you might place it at home yourself, which is helpful. The bathrooms and bedroom are pristine. The fire was laid when we arrived, with a welcoming tray of teas/coffee and shortbread. The books and cosy sofas, local walks direct from the doorstep and the astonishingly beautiful views from the south facing garden and patio area completed our delight, We will be back. Many thanks to our our helpful host. South coast is 30 - 45 minutes drive. Brighton and Hove beaches are fairly busy in summer. Seaford beach is quieter and good for parking too. Cuckmere Haven and its visitor centre are 45 minutes drive, where you can walk to the sea and up to Beachy Head. Gatwick Airport if 45 minutes drive, or 30 minutes by train from Plumpton station. Newhaven-Dieppe ferries are 45 minutes drive away. Nearest villages are Plumpton and Ditchling, both approx 1 mile. County Town of Lewes is 6 miles away and Brighton is 9 miles away. Many places of interest lie within a 10 -15 mile radius. Lewes, Burgess Hill, Hassocks, Haywards Heath all within 8miles and offer good shopping, supermarkets, banks, train stations etc. Many good restaurants and pubs locally. Swimming at Lewes Pool (also Pells open air lido in summer) or the Burgess Hill Triangle.